The Air Jordan 6 All Star 2017 edition will be part of Jordan Brand’s All-Star lineup during the 2017 All-Star weekend in Charlotte. 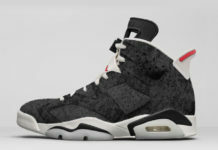 This Air Jordan 6 will have a price tag set at $225 USD, which suggests that it could be another “Nike Air” release. While we have yet to see any images, could we finally see Jordan Brand release the “Reverse Infrared” pair that we’ve all been waiting for? Michael Jordan did wear the “Black Infrared” Air Jordan 6 during the 1991 NBA All-Star game, so hopefully that’s an influence to it happening. We also gave you some information on a few other 2017 Air Jordan release dates that you can check out here. UPDATE: Here’s the Air Jordan 6 “All-Star” aka “Chameleon” that drops on February 17th, 2016.